The original version of this article, by Jason Bremner, appeared on the Population Reference Bureau’s Behind the Numbers blog. The panelists came from four environmental organizations whose starting point for working in these remote places was the protection of the biodiversity and natural resources upon which all life depends. Dr. Vik Mohan, physician and medical director for Blue Ventures, talked about how he and his organization transitioned from focusing initially on the conservation of coastal marine reserves and coral reefs to now working to improve health care, including access to family planning. Blue Ventures, in response to community and women’s needs, opened a family planning clinic, and on the opening day, 20 percent of the women of reproductive age in the community came out to request contraceptives. Today they offer a whole spectrum of short- and long-acting contraceptive methods through partnerships with Marie Stopes International, Population Services International, and various funders. Blue Ventures reported that contraceptive prevalence had risen from 8 percent when they began in 2007 to 35 percent today. Continue reading on Behind the Numbers. Photo used with permission courtesy of PRB. 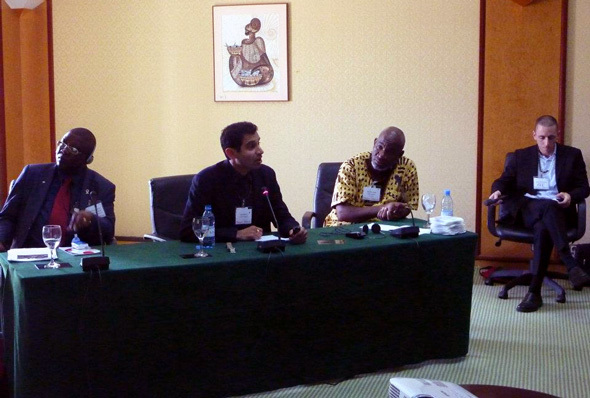 Left to right: Didier Mazongo, WWF; Vik Mohan, Blue Ventures; Baraka Kalangahe, Tanzania Coastal Management Partnership; and Jason Bremner, PRB. This panel was dynamite. Really appreciated the insights from common problems and approaches in very different settings. Just wish the organizers had reversed the order of the panels so that this one led off the PHE at Dakar morning and the one on Reaching Out at Rio and communicating across communities would have followed.